The company offers the triple shaft 200 gallon VersaMix designed to provide maximum process flexibility to the user. 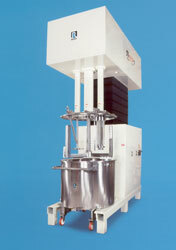 The mixer is constructed using 316 stainless steel wetted parts. Many unique features are included such as a High Shear Rotor-Stator Mixer, High Speed Disperser, and a Three Wing Anchor with scrapers to wipe the sidewalls of the vessel. The vessel is jacketed to heat or cool and the unit can operate to 50 psi pressure and 29½ hg vacuum. Change Can Models are available from a one gallon bench top design to 750 gallon production sizes.